Cushings disease in dogs is a very common, yet very misunderstood canine health disorder. In this article I will explain what canine Cushings disease is, the causes, the common clinical signs, and what tests are best to diagnose it. Then you’ll see the most important conventional and holistic options used to treat Cushings. Cushings disease is an overproduction of a hormone (cortisol) which produces the signs of excessive drinking and urinating; the veterinary term is hyperadrenocorticism. Cortisol is produced by the adrenal gland, and is usually released during times of stress (ie fear). The cortisol alters the metabolism, preparing for ‘fight or flight’, by releasing fat, sugar and keeping in water/sodium. When this occurs over time, your pet’s body is seriously affected resulting in many of the clinical signs, such as muscle wasting. 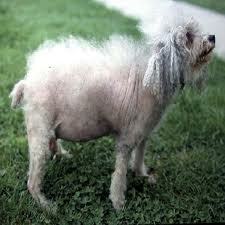 Cushings disease is most often seen in small breed, older dogs. The biggest clinical signs are increased drinking and urinating excessively. Most dogs have a distended, swaying belly; the excess cortisol causes loss of abdominal muscle. Many dogs have skin changes seen as hair loss and a sparse hair coat, at times the hair loss is symmetric. In most dogs there is an increased, appetite, and excessive panting. These dogs typically have been tested for other causes of increased drinking (including diabetes, kidney and liver disease) and all tests have come back negative. The most common cause is due to a tumor on the pituitary gland (a gland at the base of the brain). A small percentage of cases are caused by a tumor on the adrenal gland (a gland in the kidneys). In some cases, pets can get all these signs by being on steroids, such as prednisone. In this case, the treatment is to wean the pet off the drug. The most useful diagnostic test your veterinarian can perform is called the low dose dexamethasone suppression test. This is the most accurate in confirming Cushings disease- about 90% of dogs will test positive. Normally if you give dexamethasone to a healthy dog, the pituitary gland will sense this, and you will see a drop in blood cortisol. In a dog with Cushings disease, ( usually a pituitary tumor), there is no drop in blood cortisol 8 hours after giving the injection. The major part of diagnosis is differentiating between pituitary Cushings disease, and adrenal tumor as the cause. This is important to know, because treatment is very different for each type. If there is an adrenal tumor is present, there is a 50% chance of it being a malignant; surgery is an option in that the tumor may be removed. If the cause is pituitary, then medical options are the treatment of choice. There are primarily two conventional options to consider in treating your dog for Cushings disease. Lysdoren is an older, cytotoxic drug which destroys part of the pituitary gland. It has serious side effects, and if given as an overdose it can give your dog a condition called Addisons disease. Trilostane is the newer drug that is treating dog Cushings disease with fewer side effects. It works by inhibiting adrenal enzymes, lowering the blood cortisol. Both drugs require that your dog take them regularly , and that there is regular monitoring by your veterinarian. Anipryl, or L-deprenyl is a newer safe medication to treat the disease. It is available from your veterinarian. 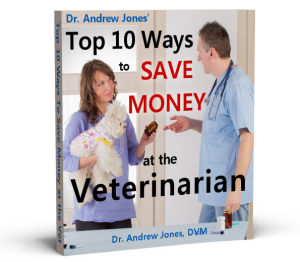 It must be given daily, and can be quite costly to treat a large dog. It works directly on the pituitary gland helping to decrease cortisol production. In Cushings, the cells are more prone to injury from the high cortisol levels. The three most effective antioxidants are Vitamin E, Vitamin C and Selenium. These are best given in combination: give 100 IU of Vitamin E, 100 mg of Vitamin C and 20 ug if Selenium per 10 lbs of body weight daily. A herb called Ginkgo Biloba has been shown to reduce cortisol production, similar to Anipryl. The dose of the tincture is one drop per lb of body weight twice daily. The dried concentrated extract is also available, give 3 mg per lb of body weight daily. Another herb called valerian can be very helpful. High cortisol levels will make your pet feel anxious. Valerian is great at decreasing anxiety levels. The dog dose is 1 drop per lb of body weight twice daily. Now you should understand exactly what Cushings disease in dogs is, the causes, plus the common clinical signs: increased drinking, increased urination, and increased appetite. The most effective diagnostic test is the low dose dexamethasone suppression test, being 90% accurate. The best conventional treatment is a newer drug called trilostane, while the most useful holistic option is a herb called Ginkgo Bilboa. my daughter has a cushings dog on the trilostane,the vet says she has a enlarged liver. is this from the cushings or meds? what can be done for the liver? But the diabetics is off the wall. He can ne 594 in AM & 96 in PM . it justs all over the place. I have to give him 2 shots a day & also do a blood test twice a day so I know how much insilin to give him. It is driving me nuts as I worry when I go to work. And I feel sorry for him with all the needle jabbing. He is 7 yrs and a wheaten terrier. I try to feed the same amt every day about the same time. The vet says he don’t think it’s the insulin but I do. I wish I would have read this article 8 or 9 years ago when my beloved daschund started showing syptoms and when diagnosed with cushings I had no idea what it was.Her whole personality changed and though st the time I was told it was a problem in the adrenal gland it turned out to be pituitary.I am surprised to see that prednisone has an ad verse effect because part of her treatment was 1/2 tablet prednisone every day.She finally died after a whole night of convulsions and howling and I felt totally helpless.It was a shock as she had been at the vet that very day for xrays and since it was rememberance day the next day I could not find a vet open to help us.If my little chihuaha ever gets this[heaven forbid]at least I am mare informed.Thankyou for your good work at informing us with lesser knowledge. This is my new email as above. I also lost my Aussie Terrier 3yrs ago to Cushings, I feel that she was not given the correct treatment and was over medicated and she was never tested for diabetes. She did elicit all the sighns of Cushings from blood tests and did okay on Trilostane for 3 months, then became very ill after an increase in dosage and started to have severe seizures. In retrospect I wish I could have known about the more Holistic treatments,perhaps I could have given her a better chance instead of them bombarding her with all kinds of pills for Thyroid, seizures and Cushings. I pray my little Norwich does not develop this awful disease, she is just 3 now. My dog was diagnosed with Atypical Cushing’s over 6 years ago. We worked with the U of Tennessee to determine a course of treatment that ended up being a melatonin implant and HRM lignans. Needless to say, this was not effective for long. Then I turned to Chinese medicine along with the melatonin and lignans.. Again, no success. Finally, after months on a maintenance dose of Lysodren, I turned to a Naturopath who does Nutrition Response Testing. I stopped the Lysodren but kept my dog on the melatonin implant and the lignans.. The ND put my dog on supplements made by Standard Process to support the Hypothalamus, Pituitary, Adrenal axis as well as supplements to support liver and kidneys. The third component was detox for mercury. My dog is doing better now than in the previous six years, and bloodwork clearly shows the Standard Process supplements are doing the job. My golden retriever at 13-1/2 had this huge seizure in the middle of the night in May(never had a seizure in her life)the paddling & release of her urine as well. Called the vet & brought her in the next day. They did a bunch of tests, finally that 8 hr test you spoke about, diagnoses was Pituitary cushings. Vet had her on phyenol barbitol(sp?) for seizures, prednisone(suppose to shrink the tumor, thats what they told me) Anipryl & she was also hypothyroid, so soloxine. The poor thing had seizures almost everyday, including gran mal seizures. (up to this problem, she had been in excellent health, but I had noticed she had been drinking more water & suddenly had some incontinence. We took care of her until the end when she had a gran mal that become one after the other. She had lived for 5 months after the first seizure and died at 14 yrs & 3 months of age. My Jack Russell was diagnosed in Oct. of 2010. He is on a maintanence dose of Lysodren 1/4 a tablet a week and he is 9 1/2 years old. He’s not as active as he used to be but he’s still my little baby. the only problem I have is him urinating in the house when I’m not home, we got him used to a litter box near the back door and that has been a furniture saver. this is a terrible disease and I wouldn’t wish this on any animal or person but with constant monitoring and meds it is possible to extend their life with good quality. I have a 11 year old lab mix who was diagnosed with Cushings 2 years ago, she is on anipryl (30 mg.) throsyn (0.5 mg.)and ursodiol (300mg.) I also give her C (500mg.) E (400 iu) Selenium (200mcg) Supraglan, and milk thistle. I have switched her to grain free food and organic hamburger. She doesn’t have much hair but seems to be doing pretty well. Her back legs get stiff and she still drinks a lot of water and thinks she is hungry all the time. If you have any helpful information to add I would greatly appreciate it. We love her dearly! My horse has cushings I have had wonderful results from an herb called Chaste tree berry.I give 1 tsp. am and an other with the pm feeding. Will this also work for dogs at a lower dose? I am another person that was ignorant in finding what was wrong with my German Shepard male puppy.Read every book I could get my hands on to find out what was wrong with him, I had the money to buy him holistic meds, first Buddy had an upper respitory infection, when I first walked into his kennel I coud hear him grasping for air, and wheezing. Took him to the vet and with all kinds of money being dished out I went broke. Kept him in the house,and kept him on Tincture for the upr infection, but he would drink in excessfully, and pee like a race horse. Called the vet and he said he is probably a diabetic, no probablies about it, the first insulin shot he collapsed and I took him to emergency. They said don’t give him anymore insulin you not knowing if he is a diabetic or not. Told them what my vet recommended and they asked if he had a test to prove it was diabetes, I said they did take his blood 3 times and I had to fight with him to get a reading, and it was high, then I injected him is when he collapsed. He could breathe better, no wheezing but I was concerned he had something else wrong. So I took him to get a second opinion, and they said he has cushings but is to far gone to save him. Took him home and stayed by his side which felt like forever, and cried. Let him go outside to be with his mother and he ran into the wood behind her. They never came back, except the mother did with her head down, so I went with a flashlight and could not find him for 2 days straight. That goes to show you not every vet knows what they are doing except throw you pills, etc. and take your money. I joined this group what might be 3 yrs now. Dr Jones was going through some hard times too, and did not want to bother him at that time. So I made my beautiful Buddy as comfortable as I could and searched for him everywhere. My opinion is…after reading all your ltters, if you are not getting results go to another doctor. From then on I followed Dr, Jones recommendation to the letter, I call his course that I took , my bible. All of the holistic remedies he told his group of members worked on my GSD and chihuahuas. Some day I want to fly to BC to meet him personally, to thank him in person. He is a wonderful, compassionate loving person. And knows what he is talking about. Another comment I must say….I went to medical school for 2 yrs. to become a vet. Had to quit for the sake of my new baby, and 2 other youngsters. I still to this day read everything possible, and watched my dogs like a hawk and fed them home cooked and raw meat on bones, vitamins that I got from Dr. Jones, and have not taken my dogs only to the vets for a heartworm check every year and nothing else. I don’t profess to know it all, but when you have a feeling that a dogs behavior is not the same, and acts differently than before. Then take your beloved pet to the Vets, or contact Dr. Jones ASAP. Don’t wait another second like I did. I regret now that I tried to treat my dog myself, not having the money to shell out for another vet, he was doing great getting rid of the upper respet. infection but should of known, that he was more sick than told, he had cushings I’m, sure of it. No dog should pee out as much as my beloved Buddy did. My dog has cushings. She is wheezing a lot more now and I fear it’s because of tracheal collapse. Is there anything I can do to help her? It used to be just when she got excited bit now it’s even at rest. I’m worried and can’t afford another vet bill. Please help if u can. I’m desperate to help my baby. She’s 12 and has been on trilostane for almost 3 years now. I see on the internet that chasteberry is used to treat Cushings disease in horses. Can it also be used for dogs? If so, in what quantity? My dog has just been diagnosed with probable Cushing’s, liver enzymes over 1000. She is supposed to go in for a Stem? Test on this Thursday. She was placed on antibiotic, after one antibiotic she worsened, thought this was coincidence, she fought me taking another, it was horrible, she lost her balance, fell, became very upset. I read about the drug, it can cause increase in liver enzymes, why would they give me that for her? No more of those. Ordered adrenal support and milk thistle after reading that it might help, I hope so. She is 13 and was so full of life still, before starting heartworm meds back. I think it may have something to do with this. I have a 10 year old Dachshund who has Cushing’s Disease. I want to use Gingko for him but am unsure of the correct dosage. He is 16 kilos (a large Standard Smooth). Can you tell me the best product to buy and also the correct dose please? My little dog is not in the best of health. She is showing some signs of cushings. She has gone for test after test. In a couple of weeks we will be taking her to a natural path . I,vet been reading your articles trying to give her some relief. When she lays down her belly is causing discomfort in breathing. We have just bought milk thistle and turmeric. I notice muscle wasting too. I keep looking for a change. Pets have a special place in our hearts and hurts when you can’t help them. Sorry to her of your loss of your black lab. Thank you for the postings. The dosages for vitamin c and e, are those per 10 lbs of body weight also?